Please welcome guest-blogger Sharon Srock. We've reviewed Sharon's first book, but this is her first guest post here at the Inkwell. This is one of the prettiest spots I ever visited. Mild temperatures, inviting water, sweet ocean breezes, and hammocks hung in strategic locations, tempting a body to slow down and take it all in. In this idyllic spot, who could fail to have a good day? Unfortunately most of us don’t have the luxury of spending days in such lazy beauty. Real life will intrude. And God is going to make good things happen to me today so I can be happy. And God is going to give me the promotion I want so I can have a good day. God is going to make sure that (insert sports team or individual here) does well today, so I will have a smile on my face. God is going to move me to a piece of beach front property so I’ll have something to rejoice about. I could type these examples all day and none of them would be true. A choice, regardless of our personal circumstances, the actions of others, failure to get what we think we want, today we will make a conscious choice to rejoice in the special day the Lord made. Spend some time with the Father. It’s hard to rejoice in what He has made if we aren’t speaking to him. Sit down and make a list of five things that you have to be grateful for. Treat yourself to something special today. It doesn’t have to be big or expensive. Stop somewhere and indulge in your favorite coffee or ice cream. Call a friend or family member you haven’t seen in a while and tell them you love them. Do something nice for someone else without them knowing about it. Sit down for a meal with your family and tell each one why they are special to you. Repeat after me…TODAY IS SPECIAL. Blurb for Terri: Despite a bustling day care center and a new foster child, Terri Hayes hungers for a family of her own. Then a plumbing mishap leaves her homeless and questioning God’s plan. Steve Evans’s gracious offer of his basement apartment as a temporary solution is an answered prayer.Steve is a successful writer and a good father, but Terri is horrified when Steve’s book research leads him to a harsh confrontation with the parents of her foster child. She needs to distance herself from Steve, but her efforts fall short as his two scheming daughters plot to make Terri their new stepmother.Will harsh words and sneaky plans drive Kelsey’s family further a part and put a wedge between Terri and Steve, or does God have another plan in store? Available now at Amazon, Barnes and Noble, Christianbook.com and Pelican Book Group. And you can read Deb's review of Sharon's first book, Callie, here. Sharon Srock lives with her husband, Larry, and two dogs in rural Oklahoma. She is a mother, grandmother, and Sunday school teacher. Sharon has one and three-quarters jobs and writes in her spare time. Her favorite hobby is traveling with her grandchildren. She is a member of the ACFW and currently serves as treasurer for her local chapter. Her first book, Callie, and new release, Terri, are part of the Women of Valley View series and are both available from Harbourlight Books, an imprint of Pelican Book Group. Barbara, thanks so much for hosting me today. I can't wait to visit with your readers! Good morning, Sharon. You were here early. I hope you left some coffee for the rest of us! I know Sharon has one of those pesky day jobs to attend to, but she'll be checking back in later. Welcome Sharon. Thanks for stopping by and sharing your thoughts with us. Sharon, I so agree! I am guilty of judging the day but I think i'm getting better (age will do that to you!) So many people who've had life-threatening events learn the true value of a day. Thanks for coming by. I wish you much success with TERRI! Ahhh. It looks so peaceful. I want to be in that picture right now. Lovely post, Sharon. Thanks for visiting. Thanks for the post. I was so blessed, as the Lord has been working with me on this very topic lately. He's reminding me to trust His character and praise Him for who He is, not what He's done for me lately. Finally home from that "pesky day job". Ladies, I'm so glad you let me visit and I'm doubly glad if any of you found encouragement from my post. Suzie, Just 30 more days and I'll be up close and personal with a beach again. I can't wait. Now to go cook dinner for the "pesky" Hubs! Sharon, where is that photo taken? It's just lovely and ...warm. I think I forgot what WARM is! 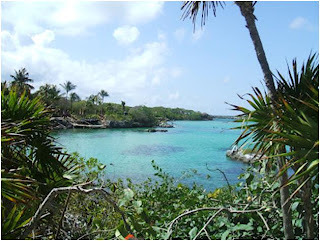 We were Cozumel for a week and we took the ferry over to the main land. It's about an hour north (I think, I don't navigate) from Cancun. It's a water park and the best I've ever been to. Ah... being content. I think it's the thing we humans are REALLY pursuing, even when we think we're after happiness, or success, or love, or whatever. Thanks for the reminder that contentment comes by faith in Him, and rejoicing is the key! Niki, thanks for your comment. A true statement but a hard lesson to learn. I'm still in school.